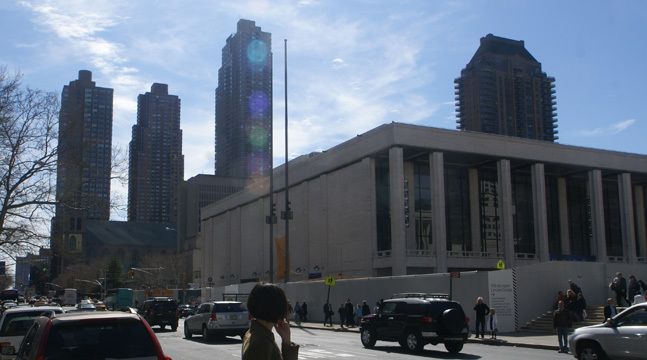 Basking in the glory of its freestanding site, this 38-story tower is one of the most visible in the Lincoln Center district. With its large, setback mansard roof, the building could have been just another Post-Modern pastiche, but the proportions and detailing here have resulted in a very pleasing composition that is both dignified and modern, nostalgic, but practical. A key to its success is it quite rigorous façade, rhythmically broken up by its balconies, and its rich coloring of Sienna colored brick and bronze glass atop a limestone base. The 224-unit condominium opened in 1987 and was developed by Carol Management Corporation and designed by Jung/Brannen Associates. The building has a health club and pool, room service, concierge and doorman. This neighborhood began to witness a tremendous burst of new construction around 2007 with several new apartment towers nearby to the south and west and Fordham University is planning to develop much of its nearby site to the east (see The City Review article). This site was formerly occupied by the Power Memorial Academy, a Roman Catholic high school that was housed in a building that had been built in 1893 for the New York Infant Asylum. 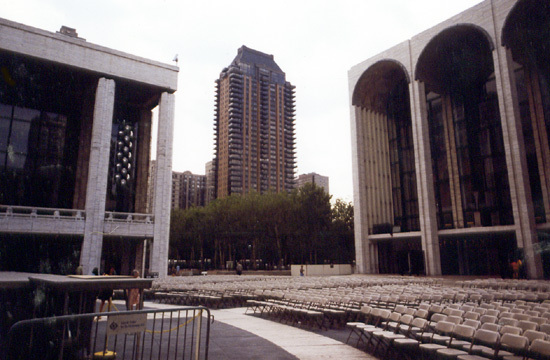 In their great book, "New York 2000, Architecture and Urbanism Between The Bicentennial and the Millennium," Robert A. M. Stern, David Fishman and Jacob Tilove said that this tower was "exceptionally prominent, especially when viewed from the Lincoln Center plaza, where it loomed over the cultural complex like an unwelcome intruder wearing a large black mansard hat." While it really is not "The Shoot-Out at the Lincoln Center Corral," the Fordham University expansion will, if unmodified, severely impact the visual space of the Alfred and the center.